For us the collaboration with students from TU Delft is very interesting. We can combine their creative input with our technical output. With exciting opportunities for new products as a result. Develop an interactive product that would support rebellious play. This was the task that was given to Industrial Design students at TU Delft. One team came up with a toy that would allow ‘builders’ and ‘destroyers’, children with very different needs and behavioural patterns, to play together. 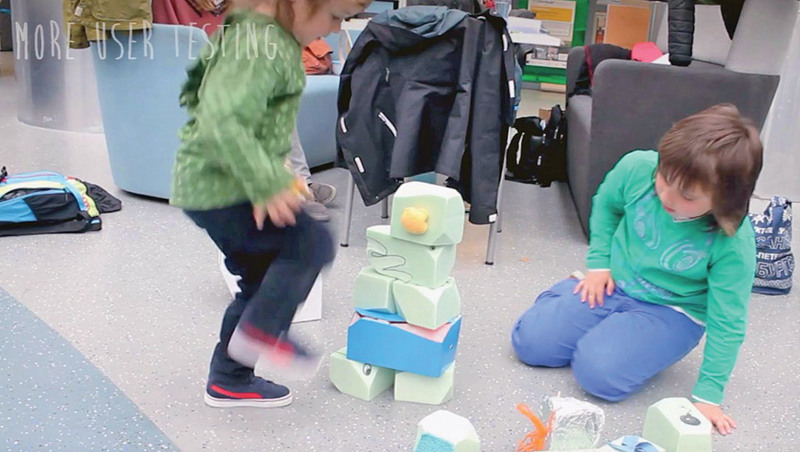 They came up with Block Me, a set of twelve interactive building blocks designed for children aged 4-9. Two of these blocks are interactive and mimic a creature with a personality. The blocks allow for interesting structures to be build that inherently are a bit unstable. The two Blocks-with-an-attitude destabilize the structure even more: when agitated by sound, like clapping your hands, they start to tremble. Once trembling, the players are confronted with a sudden choice: make more noise and watch the structure fall apart, or soothe the Blocks by caressing them and build even higher. This topic brings builders and destroyers together. The students did research and tested the concept with children. The company NyoyN chose Block Me as an interesting concept, developed it into a working prototype and is looking into market possibilities for the near or distant future.